Our custom peptide synthesis offering is based on decades of trading and hundreds of working years gaining valuable experience in the field. During this time, we have produced in excess of 9,000 peptides on a custom synthesis basis and we have become experts in the production of long peptides and complex peptide structures such as folded proteins and peptide conjugates. We have a proven track record in high quality supply, while providing excellent customer service through the balance of technical expertise and project management. Peptides are produced by Fmoc / tBu solid phase synthesis and can be manufactured on the scale of mgs to 10s of grams. Most projects are completed in an efficient high throughput basis using parallel synthesis equipment, with a short lead time of less than 4 weeks. Our entire range of standard peptide modifications are available per your request, including labelling with biotin, fluorescein or other fluorophores, or the formation of disulfide bridges. Unnatural building blocks, such as phosphorylated, acylated or methylated amino acids, are routinely incorporated into the peptide sequence. Additionally, we have a license from Life TechnologiesTM that enables us to incorporate the highly desirable AlexaFluor® dyes into synthetic peptides. We routinely synthesise peptides in excess of 100 amino acids in length. The longest peptide we have manufactured by linear solid phase synthesis was made from 276 amino acids. We have broad experience in synthesising peptides and short proteins containing multiple disulfide bridges, ensuring that the molecule has the desired biological function. Chemokines, Defensins, Conotoxins, and Complement Proteins are all examples of products that we have successfully produced. Cyclised peptides enable conformational and chemical stability. Head-to-tail cyclisation, lactam bridge formation, “stapled” peptides through olefin metathesis and directed disulfide bridges, are all types of the cyclisation methods we employ. We provide complex peptides as catalogue products for basic biological research. We have our well established catalogue of chemokine products for use in wide-ranging research. More recently we have established a range of products for epigenetics research such as histones and ubiquitylated peptides. 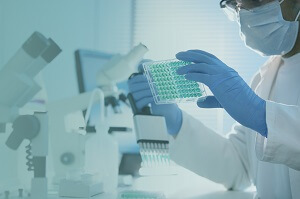 These products are highly specialist, and many are unique to Almac, offering physiologically relevant reagents for research.